Lock in a great price for Hotel Porta San Mamolo – rated 8.8 by recent guests! The staff was very helpful with suggestions of places to visit and a restaurant. Nice garden in a city location . Close to sites we wanted to visit. Breakfast had a good variety. A boutique hotel surrounding a courtyard. The courtyard environment was charming. The neighborhood, just within the walls of the old city, was within easy (5 minute?) walking distance of the main city square. The room was generous and lovely, with both ancient touches and modern amenities. Good breakfast, served tea in a pot which I like. Lots of fuit, cereal, pastries, meat, bacon, eggs, cheese, fruit or green salad. Comfortable bed, about 15 minute walk to centre of old area of town. Bathroom big and lots of towels. Parking may be possible in blue line parking in front of hotel. We had our car there all three days for 9 euros a day as opposed to the private garage which was 20 euros. Not sure how this would go in prime tourist season. Beautiful patio area for breakfast and late afternoon drinks. Lovely decorated hotel. Very helpful staff! Very Italian with a very personable owner. Staff was excellent. The courtyard was very nice and the breakfast was good. We liked everything until we got to our room. The staff was helpful. The staff was extremely welcoming. They were accommodating: working quickly and easily on my personal requests. The "colazioone" was bountiful and healthy and served in the beautiful courtyard of plants, trees and flowers. I personally like the location in Bologna: close enough to the main piazza and far enough from the crowds and noise. My room was beautifully decorated, very comfortable, and was very clean! The staff frequently asked how I was doing: a very personal touch! The location was excellent 15 minutes from centre . The staff could not be more helpful . The room was perfect with the air con . The beds were very comfortable . . Breakfast was in a room off the garden you could eat inside or outside. Plenty to choose from fruit, cold meats ,cereals , breads etc a great start to the day. . The staff on reception recommended the restaurant across the road which turned out to a great choice . I would recommend this hotel to anyone . It was perfect for our group. The folks at this hotel are accommodating and go out of their way to help - they were the highlight of the trip. Bologna is not a fun place to drive to begin with so the hotel's relative location to all things great in Bologna was helpful and can be seen as a great extra. There are plenty of restaurants in the area to please the most ardent gastronomic enthusiast and sight seeing is a stone's throw away. IMO: The woman at the front desk when we checked in couldn't have been a better host. Hotel Porta San Mamolo This rating is a reflection of how the property compares to the industry standard when it comes to price, facilities and services available. It's based on a self-evaluation by the property. Use this rating to help choose your stay! Porta San Mamolo has its own garden where you can enjoy an excellent free breakfast. 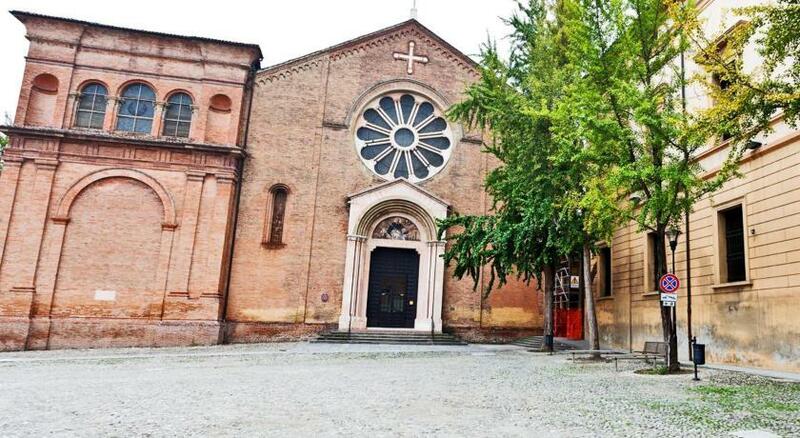 It is in a quiet location, just a 10-minute walk from Bologna's main square. Rooms are modern at Porta San Mamolo. Some have terraces with city views or a private entrance from the garden. All are very comfortable, with Wi-Fi access and satellite TV. There is a TV room and a 24-hour lounge bar as well as a furnished courtyard. You can have your breakfast here from 7 a.m. until 10 a.m.
Staff really care at Hotel Porta San Mamolo and you will have great service here, 24 hours a day. Buses leave from nearby. Bologna's famous towers are a 15-minute walk away. When would you like to stay at Hotel Porta San Mamolo? Air-conditioned room with satellite TV. This twin/double room features air conditioning and mini-bar. Some rooms also have a spa bath. House Rules Hotel Porta San Mamolo takes special requests – add in the next step! Hotel Porta San Mamolo accepts these cards and reserves the right to temporarily hold an amount prior to arrival. We were very impressed how quickly they solved the issue when a fuse did blow. It took about 10 mins from the call till it was fixed. Also, at check in, the lady at the hotel gave us recommendations where to eat at our next destination (she grew up there) and they were brilliant. The first room was on the ground floor and it was a bit noisy. However I requested to move room and the second room was much quieter. Staff very helpful. Not the best shower, temperature fluctuated.Not great water pressure. Room had minimal natural light and looked out onto ivy covered courtyard, probably pleasantly cool in summer but dreary in December. Unusable sofa bed which did not completely fold so seat raised. Bedroom area cramped. No tea/ coffee in rooms or bar. Shame as breakfast area could have a small help yourself point- nearest hot drinks 2 blocks away. I stayed already twice in Hotel Porta San Mamolo in 2016 with my son and now we returned with the grandparents to let them experience this beautiful hotel in Centro Storico of Bologna. I really love the place. Friendly staff and an extraordinary breakfast. Take your time here and just enjoy. The various dishes and the beautiful greenhouse style breakfast room will give you a great start into the day. Small courtyards with trees and plants are inviting you to take a deep breath and just sit down for a while on one of the couches. I had problems with my car and was assisted by the hotel manager which I really appreciated. Air conditioning working. Better soundproofing between rooms. Tired old carpets need replacing. The staff were delightfully helpful and accomodating. Weather when we were there was not very good and we felt the rooms were a bit chilly especially in the evening. Would have been nice to have tea and coffee facilities in room as well as the minibar. "Double" bed was two singles on wheels that kept moving apart. Very friendly and helpful staff. Location was a little way out of the city but only a 20 minute stroll. Based on price and location I would happily recommend this hotel to other visitors to Bologna. We had room in the garden, nice comfortable good size room & bathroom, good restaurants nearby. Friendly & helpful staff , pretty garden, very good breakfast. Not a lot to dislike really, maybe it could have a bar. Staff really helpful, good breakfast, room lovely & clean & we had a massive veranda. There could be some additional towels in the bathroom - there was only one big fluffy one for each of us and a very thin one in addition - it was difficult to dry hair in that. There were no blankets in the room, only sheets, but the blanket was provided as soon as we asked for it. Very nice and comfortable hotel on the outer border of Bologna's old city - easily within walking distance to Piazza Maggiore and all the major sights but the closeness to the outer city means we could park our car in public parking space and not navigate the old and narrow streets or buy the special permit for that. The room was spacious and air-conditioned (it was important seeing that the temperature outside was above 30'C! ), also clean and tastefully decorated. The bathroom was well equipped and modern. The breakfast was good and served in a romantic garden. We adored the "hotel owner" - the friendly white cat in the lobby. :) Would definitely recommend this hotel for anyone who wants to experience truly Italian charm.